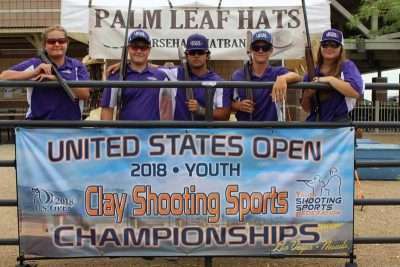 On Friday, July 13 and Saturday, July 14, the Lassen Grizzly Claybreakers represented Lassen County well at the United States Youth Open Clay Shooting National Championship in Las Vegas, Nevada. The U.S. Youth Open was firecracker hot with temperatures higher than 108 degree, but the Lassen Grizzly Claybreakers were also firecracker hot and determined to make their presence known at the $26 million Clark County Shooting Complex. The Claybreakers saw teams from as far away as Alaska as well as teams from Florida. The National Championship was a 200-target event with 100 targets on Friday and another 100 on Saturday; there was a possible squad score of 1000. For the varsity, Tyler Johnson shot a 100 straight on Friday and followed up with a 97 on Saturday for a 197 score to lead the team. Next, team captain Wyatt Spalding — who led his varsity team to a year-end second place finish and also a second-place state finals finish — shot a 97 on Friday and came back with a 96 on Saturday for a total score of 193. Jake McCart shot his usual great scores; he broke a 95 and 92 for a 187 total. Right on Jake McCart’s heels was little sister Rylee McCart, who had to switch guns one week before the finals and still pulled off two fantastic scores of 90 and 94 for a 184 total. Next was Cali Jones, a junior varsity shooter who stepped up to varsity so the team could field a full five-man squad and be able to compete in the National Championship. Jones shot a 76 for Friday and a 79 on Saturday for a two-day total of 155. Coach Phil Giusti commented, “As usual, our 2018 varsity was plagued by being so small a team. When a couple of our top shooters could not make the trip to Vegas, there was no backup as usual, and still the varsity pulled off a great 916team score. But not good enough to place at this huge event, and its not that they didn’t try; they practiced every chance they could before we left for Vegas and Rylee came to my house and practiced with her new gun every day and it showed in her great scores. For the junior varsity squad it was superstardom as usual. Caleb Montgomery crushed 99 targets on Friday and backed it up with a 97 on Saturday for a 196 score that landed him in a two-way shoot-off for first place against Tyler Parrett, from Berean Christian High School. In the first nail-biting round of the shoot-off, both shooters went 25 straight. On the next round, Parrett dropped the sixth target and Montgomery dropped the ninth. Then, Parrett dropped two more targets. Montgomery didn’t miss another target after the ninth. Thus, Montgomery became the number one junior varsity shooter in the United States. 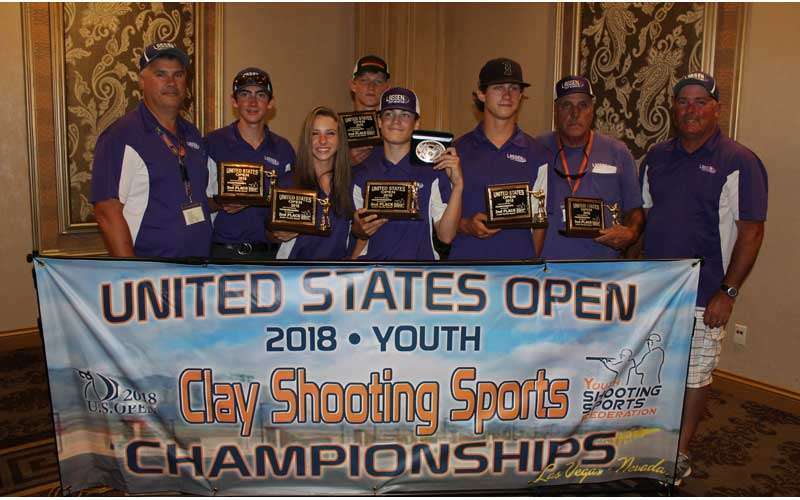 The second-highest shooter for the junior varsity Lassen Grizzly Claybreakers at the National Championship was team captain Triston Ingwerson. Prior to the Las Vegas shoot, Ingwerson had led the junior varsity team to a year-end first-place finish and a first-place state finals finish. At the National Championship, he shot a 97 and a 96 for a total score of 193 targets. Next was Kaleb Kiar smoking 98 targets on Friday and 94 on Saturday for a great total of 192. Then, Bailey Spalding crushed 92 targets on Friday and backed it up with another 92 on Saturday for a score of 184. Finally, Jacob Daniels shot a pair of 85s, which was enough to give the junior varsity team a combined team score of 935 out of 1000. The computers were buzzing and a field of officials were tabulating. 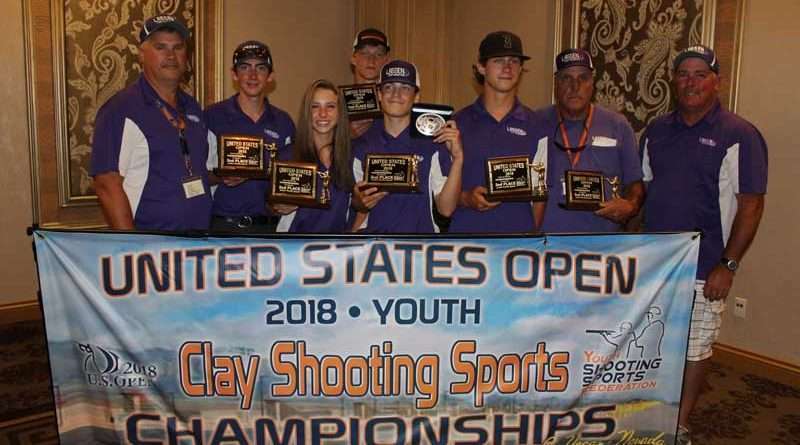 When the results finally came in, the junior varsity Lassen Grizzly Claybreakers were the number two team in the nation, just nine targets shy of winning first to Auburn High School. Regarding the junior varsity squad, Giusti commented, “You know, all year we competed against division three schools and there are 14 schools in that division; that is hard enough, but when we go to Vegas, there is only one varsity and one JV division for the entire U.S. Our JVs pulled it off. Guisti later said, “As for Montgomery, in that nail-biting shoot-off when he missed that first target I looked over at coach Spalding and said he is not going to miss any more and he did not. I can’t tell you how I knew, I just did. It was a very emotional moment for all the team members and family because they were all there; every single one of them watching on and holding their breath for Caleb. After the shoot was officially over, the hosting Youth Shooting Sports Federation held an awards banquet for the many teams. Guisti said, “At the awards banquet that was held at the Sun Coast Hotel Ball Room, there were over 1,000 people in attendance and the Grizzlies were picking up so many awards. I had no less than a dozen coaches come up and shake my hand and congratulate us. That has never been done before by that many coaches.